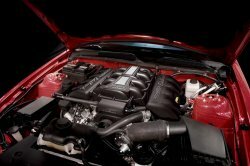 E-Force 2010 Ford Mustang GT Supercharger Kit  : Supercharger Superstore, Your Online Source for Vortech Superchargers, Paxton Superchargers, Procharger Superchargers, Magnacharger Superchargers and Techco Superchargers! The Edelbrock E-Force Supercharger System for the 2005-10 Ford Mustang 4.6L 3V will allow you to boost your Mustang to a very impressive 466 flywheel horsepower and 439 ft./lbs. of torque. 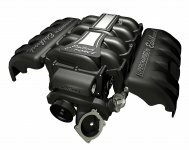 This system was exclusively designed by Edelbrock to provide instant, reliable and safe horsepower for a stock Mustang 4.6L with low boost for minimum stress on the engine. The optional Edelbrock supplemental warranty, 3 years or 36,000 miles for 2004-08 models and 5 years or 60,000 miles for 2009-10 models is designed to give you piece of mind when installing the Edelbrock E-Force Complete Supercharger System on your brand new vehicle. 466 HP and 439 ft./lbs of TQ with low boost!